This PLS is a lot like the PLS about wheel alignment. If you’re prepping for short-term emergencies, it’s a skill you won’t need. If your tire fails, pull out the spare tire-wheel assembly, change it, and be on your merry way. But, if you’re forced to leave paved roads and multiple tires suffer damage, likely you won’t have more than one spare tire. How do we repair a tire and what tools are needed? If you’ve repaired your own bike tires, you might think you can just replace a tire tube or patch it. Some smaller tires use tubes, but modern automotive tires do not. The rubber of the tire seals to the rim. To repair a puncture, you need to remove the tire from the rim, patch the tire so that it will hold air, remount the tire to the rim, and (somehow!) fill the tire with air, getting the tire “bead” to seal. A temporary fix is just using a plug that is applied from outside the tire. This is not considered a permanent repair. But it might see you through till you reach a service station. A patch with plug as describe below is considered a permanent fix. This video from one of my favorite automotive do-it-yourself channels talks about replacing a tube in a tire. Much of the information, like getting the tire off the rim, is similar to what you need for a tubeless tire. This video talks about replacing the tire’s valve stem. This video has a nice close up showing how the valve stem fits into the rim. You should purchase a special tool for this job. You should own tire irons and not use a big screwdriver, too! Here is a video showing you how to patch a tire. In short, if you have trouble getting the bead to seal, bounce the tire around a bit and apply a strap around the tire to force the sides of the tire out to encourage the bead to seal. If your rim is old, you might want to purchase a bead sealer to apply to the rim and tire. If you’re trying to locate a small leak in a tire, you can submerge it under water or use the soap trick I described in the book for finding natural gas leaks through black iron piping. Same concept, different application. If you have an old tire and rim, you might want to give this a go as a prepper exercise. For not much money, you can learn a new skill that can keep you off-roading even after your last spare tire has blown. On the news there was a good story about how to escape a car that has crashed into water and is sinking. Many people will instinctively roll up the window to keep the water out and try to dial 911. Just get your seat belt off, get your window down or break it, and get out immediately. If the car has sunk too far, you won’t be able to open the door because of the force of the water pushing the door closed. Good stuff to know. Here’s a great video by TheLordHumungus about preparing for everyday life. I highly recommend you check out his Youtube channel. The zombie apocalypse likely won’t happen, but each of us will be subject to numerous emergencies and lesser disasters throughout our life. We should aim to be prepared in everything we do! Many law enforcement agencies have reported an ammo shortage over the last few months. Ammunition might become the new cigarettes. Many states are proposing new taxes on ammunition. Among the proposals: A 5 percent tax in New Jersey and a whopping 50 percent ammo tax in Maryland. Congress is actively pushing tax legislation to force the national collection of sales taxes online. This means an online ammo seller in Texas would be subject to the tax collection authorities in a place like New York. It will allow states to reach across state borders to enforce their tax laws on sellers located in other states. Most preppers have heard about the financial melt down in Cyprus. It’s the same old story: Banks close, people can only get some of their money. Companies have no money to meet payroll, so workers go unpaid. Stores lack the money to get new product. Few stores accept credit cards, because the store feels it won’t be paid. People with money are rushing to the stores to get food. Russia is offering to bail out Cyprus in exchange for the country’s offshore oil and natural gas drilling rights. Closer to home: In America, record numbers of people are now on Federal disability paid by Social Security taxes. These people don’t appear in the unemployment numbers and most will never return to work. I was surprised to learn that children are on worker disability too. If they can’t do well in school, they’re considered disabled and they get money. It’s estimated that the Social Security disability trust fund will be “exhausted” by 2016. Lesson: Never consider any source of income absolutely secure. Things change, times change. This is just a quick post to share what I believe are the top ten prepper guns. These aren’t necessarily the ten I like the most. Instead, they’re the ten choices I see most other preppers choosing. The list is by no means statistically sound. The guns are in no particular order. 1. The Ruger 10/22 in 22 LR. It’s inexpensive and cheap to shoot. It has largely replaced many of the old-school choices like the Marlin 39A’s. In a pinch, you could defend yourself with it. 2. The Mossberg 500 in 12 gauge. A reliable pump shotgun that is a common alternative to the next weapon. 3. The 870 Remington pump in 12 gauge. I’ve heard really old timers say they think these are junk. But they keep going for most of us! 4. The Glock 19 in 9mm. Probably the most popular defensive pistol choice in the world. Reliable. Shootable. Simple. 5. The 1911 45 ACP pistol. This is on the list because it is the overwhelming choice of old-school preppers and survivalists. Shootable. 6. The AK-47. The world’s most popular fighting rifle. Relatively inexpensive compared to the next weapon. 7. The AR-15. Accurate. Shootable. Some don’t like the tiny bullet. 8. The Mosin Nagant rifle. This is hugely popular because it’s so inexpensive. Many preppers purchase four, five, or six of these. For that cost, I’d just get a modern bolt in 30-06! 9. The M1A. This is a hard hitting rifle favored by many old-school survivalists. The link is to a very, very, very, very long video by nutnfancy. 10. Each weapon above is a particular model. I’m at a loss for number ten. I can’t think of any weapon that clearly stands out as a prepper favorite. I thought about the 357 magnum revolver, but some like the newer Rugers. Others S&Ws. Same problem with the 44 magnum revolvers: no model stands out in clear popularity. I contemplated the 30-30 because of it’s choice among old-school preppers. But, here to: The Winchester 94 or a Marlin? A 30-06 bolt came to mind, but again no particular gun stands out as overwhelmingly popular. A 22 LR Ruger standard pistol, or Mark I-II-III would be another choice. A combination Savage type weapon or the AR-7? Smaller concealed carry weapons vary hugely. The FAL is popular, but not so much to make the list when compared to the other guns. In the end, I decided to leave number 10 blank! Disclaimer: This post is only based upon my perception of popularity. Here’s a really good post (TNgun.com) and video about when to use lethal force. It talks about the moral and legal aspects you need to come to grips with before you carry or keep a gun for self defense. I like the distinction between “Thou shall not kill” and “Thou shall not commit murder.” I agree with everything David Nash says, but would add one thing: In a serious WROL crisis, protecting your supplies might be necessary to ensure the survival of your family. This can become a complex moral issue, and, as Nash says, we really must sort this out on a personal level. A good Youtube video by eNosArmory talked about the top ten skills for a prepper. In this post, I’m going to write about what I see as ten top personal characteristics for a prepper or for a survivor. Like skills or equipment, we can work to improve personal characteristics. 1. A will to survive. Perhaps, ironically, under the most painful circumstances just wanting to live doesn’t provide sufficient motivation. It’s good to have some purpose higher than just your own survival. You have to have something you really want to live for. Several stories portray people badly mangled by buses, cars, trains, and other machinery. They’re alone with no one to help them. They’re in extreme physical pain, sometimes with broken backs or lost limbs. Rather than lie down and stop fighting, they struggle against the pain and survive. When asked what saw them through the event, many times they respond by saying that they had a small child they had to take care of at home. They worried about what would happen to the child if they died. It’s good to find some purpose in your life that will motivate you and allow you to overcome adversity. This won’t help you much with your day-to-day prepping, but could help you survive in extreme circumstances. 2. Adaptability or flexibility. The easier you can adapt to a changing world, the more likely you are to survive and thrive. Many of us are set in our ways. I know I am. We have our likes and are dislikes. Food is a good example. We like to eat certain things. In a wilderness survival situation, we have to change our way of thinking about food. We truly will be “eating to live” rather than “living to eat” when scrounging for food. Taco Tuesday will be replaced with leap frog Friday. Some people perish because they can’t stomach what is fully edible. To improve adaptability, try something different that you don’t usually do. Move a bit outside your comfort zone. 3. A desire/willingness to learn new things and improve. This is related to #2 above. It’s always better to see yourself as a student than as a teacher. The student is learning new things and gaining new skills. Watch out if you find yourself saying something like: “I’ve done it this way for twenty years.” Maybe, there’s a better way today. The best way to improve your willingness to learn new things is to learn new things. Pick something you don’t know but are interested in and begin learning. It could be gardening, upholstery, playing a guitar, anything, really. It’s the process of learning something new that’s important. With this attitude your skill set will constantly grow throughout your life. You’ll build up your bank of personal experience. You never know when you’ll need to reach into that bank of skills during a crisis. 4. Courage. Courage is an important attribute. I’m not saying you need to go into the woods and try to wrestle bears. But in a crisis, you might need to summon the courage to do something you’re afraid of. You must take the appropriate risk for the situation. Self defense provides a good example. If you’re forced into a self-defense situation, you must vigorously defend yourself. Some people will hesitate. They’ll be tentative. Mentally, they don’t want to accept that they’ve been put in this horrible situation and they just hope it will go away. You must have the courage to face whatever situation you’re in. Courage isn’t about training. It’s much easier for Chuck Norris to be “courageous” in a fight than an untrained fighter. When the prospect of death is at hand, pretty much anybody can lose it. If you have a need for some situation-specific courage, the better prepared you are, the easier it is to act. 5. A prepardness mindset. We’ve discussed this before as being a key to being a prepper. You need to think about what can go wrong. You need to think about what preparations you need to make, and then make them. I stumbled upon a story of three ladies, who on the spur of the moment, picked up and took a road trip through Death Valley. They became lost. They hadn’t let anybody know about their road trip. They didn’t have a desert survival kit in their car. If you’re taking a road trip through the desert, spend a bit of time learning about desert survival. Carry plenty of extra water. Let somebody know the route you’ll be taking. I wrote about a similar winter experience in The Prepper Next Door, where a family becomes lost. I emphasized there that we often underestimate the dangers of modern vehicles carrying us far away from modern, safe, civilization. A prepper will always ask “What if my vehicle breaks down? What if I become lost? What if…” Asking questions like this will lead you to the solutions and the preparedness steps you must take. 6. Confidence in yourself, specifically, the belief that your actions can have an impact in your life. This is related to Courage and a Will To Survive. It will motivate you to take action. A neat little news piece talks about this. 7. A sense of happiness/acceptance with your own life. Forgive your own mistakes. Accept that you’re not super man/super woman. How the heck does this help our survival? Life stress is largely cumulative. It builds up from multiple fronts. The more your life is in order, the more clear-headed you’ll be. The happier you are, the easier it is to focus on the important and let less significant things go. This will help you focus on the problem at hand without pent up frustration overwhelming you. 8. An ability to contain stress/frustration/anger/fear. This is related to #7. All of us will have some stress no matter how perfect our lives otherwise is. The ability to function under stressful circumstances is a key to survival. The ability to “think on your feet” is a valuable skill. Some survival experts argue that actual IQ drops during high stress. Focus on the basics. Assess the situation. Take an inventory of what you have and where you’re at. If you’re lost in the woods, don’t run around. Sit down, take a deep breath, and look around. Calm yourself. Many are familiar with the story of climber Aron Ralston, who had his hand trapped by a boulder. He assessed the situation before deciding to cut off his hand to escape. When engaging in activities that can turn dangerous-climbing, canoeing-it’s good to have a buddy with you. This alone will reduce stress in a tough situation. 9. The ability to think for yourself and not blindly follow the crowd. I’ve written about this pretty extensively in the book and won’t repeat all that here. Suffice to say, we often look to others for clues about how we should react to strange situations. The other people often don’t have a clue. This leads to a situation where the blind follow the blind. And, because everybody seems to be going along, nobody objects. A common exercise for both survival and group leadership is to ask people to rank items in order of importance and see how they answer. For example, you might be given a plane crash in the wilderness as the scenario and a list of items on the plane. Which items do you feel are the most important? Why? The interesting thing in this exercise is that the most vocal often have the most say, regardless of how much they actually know. A person with extensive wilderness experience might go along with the consensus, even though he feels it’s totally wrong. It reminds me of an old joke: An airplane pilot has a heart attack. The stewardess asks if anybody can fly a plane. A passenger jumps up and tells the fellow sitting next to him to follow him and help him. The first guy takes the controls and starts barking out orders. The plane crashes. 10. If you’ve read this far, you already have persistence. For our last personal characteristic: Resiliency. The ability to bounce back from setbacks. If you have a strong will to survive, adaptability, a desire to learn, courage, a preparedness mindset, confidence in your actions, the ability to work through stress and fear, independence of thought, and resiliency, you’ll be psychologically very well prepared for adverse survival situations. Charlie Palmer – author, The Prepper Next Door. Here’s a good article about pepper sprays. A good interview with David Nash, about his book about handguns. Colorado is banning magazines over 15 rounds. I know I shouldn’t feel angry at things like this. But as somebody who follows the rules, I hate it when a person feels they have the right to trample the rights of others. Too many people feel a sense of entitlement. The preppers I’ve known tend to be very ethical, honest, and moral. But we’re smart enough to know that not everyone follows our values and code of behavior. In a crisis, standing in line for hours waiting for food, water, or gasoline is a thousand times more stressful than waiting 15 minutes to get some stamps. This is why it’s good we have our own supplies. We also know that the people who flaunt the rules have no problems trying to take what is rightfully others, if they think they can get away with it. One thing I’ve heard from non-preppers is that survivalists and preppers just want society to fail. I don’t think this is true. But I do think many preppers see society as in some kind of downward spiral, and, maybe, the only real way to fix it is a major overhaul. They’re tired of being neutered citizens who aren’t lawfully allowed to protect their own rights. The infuriating thing about line-cutters is that there usually isn’t a whole lot you can do if they cut in way ahead of you and the person they cut in front of isn’t willing to object. There seem to be more and more line-cutters these days. The incident got me to thinking about the liberals plans to “reform” immigration. We’re told that illegal immigrants shouldn’t need to “live in the shadows.” But these people are here illegally. It’s just like saying that burglars shouldn’t need to hide in the shadows. If you break the law, you might get busted. Why shouldn’t people have to follow the rules? Now, I’m not against legal immigration. If you follow the rules, you should be able to become an American citizen. In the old days, you had to pass a civics test. You had to be employed. You had to have a sponsor. In a real sense, illegal immigrants who want a fast-track path to citizenship are line-cutters. OK. If I lived in Mexico, I’d want out too. But more and more Americans are like the old lady in line who don’t object to line-cutting and even enable it. In many parts of the country, we’re told that conservatives who oppose immigration “reform” can’t get elected. So we just need to stand by as others cut in line. Here’s an article about dealing with line-cutters. Some line-cutters can be not only quite rude, but aggressive. Here’s a story about a line-cutter that punched a man. Punched dude had a gun and the line-cutter ran and hid behind a refrigerator. Here’s a video about a line-cutter who got angry when a guy on his cell phone talked about the woman trying to cut into the line! Woman line-cutter sicked ex-con boyfriend on the guy and it turned into a vicious assault. A good lesson: Always pay attention to your personal space and the aggressive behavior of others. Up close, looking away won’t always defuse a bad situation. It might just get you sucker punched. An interesting home-buying tip: Call the local police and ask them about the house you intend to purchase. Does it have a criminal history? Surprisingly, many foreclosures today are “meth houses” where the illegal drug was produced. This can lead to toxins in the home. What Does It Take To Be A “Prepper”? The other day I wasted nearly 30 minutes listening to a Youtube rant about who were and who were not preppers. That rant got me to thinking about how I define a prepper. How would I say a person is clearly a prepper? Well, of course, preppers prepare to survive disasters and emergencies. But I think the key factor is that a “prepper” has a preparedness mindset. If the TV news anchor comes on and says a hurricane is about to hit the coast and advises people within a certain area to evacuate and tells others they should hunker down, does following that advice make one a prepper? I’d say not. They’re just doing what they’re told. But if the person takes the advice to heart and begins thinking: “Hey, I should be prepared for all future hurricanes. And what if something else happens where I couldn’t rely on the grocery store?” Then the person takes some simple steps to protect their future. At that point, I’d say the person is a prepper. 1. A Prepper Has A Preparedness Mindset. 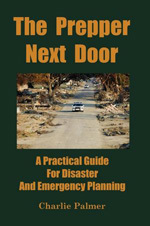 Preparedness becomes a constant theme in the lives of many preppers. This mindset requires no special skills, no special abilities, and no particular religious or worldview. Preppers understand that things don’t always go well, and they want to be ready when something goes wrong. Preppers realize that the steps they take now can help them in the future. This is very different from any given set of survival skills. There are people out there with tremendous survival skills who I wouldn’t call a prepper. An example that comes to mind are free climbers who scale thousand foot rock faces without any safety ropes. What if something goes wrong? What if it rains? A long time ago in a welding class, I saw a young fellow faint. He just fell down. He was OK. What kept going through my mind was how lucky it was he wasn’t holding a torch at the time. What if a free climber with no safety net just happened to faint? No person should put themselves into such a precarious position that their life could be lost so easily if something goes wrong. Despite our best preparations, something unexpected can do us in. We could faint while driving down the freeway. We can’t avoid all risks, but we should be aware when we’re taking unnecessary ones. Being aware of the risks we face is inherently part of a preparedness mindset. 2. To be a prepper requires that we try to make whatever preparations we feel are necessary and sufficient. This is a natural consequence of the preparedness mindset. It’s also a highly personal thing. What one person considers adequate preparation, another person might feel is woefully underprepared. Some preppers feel secure with a two-week supply of reserve food. Others want a two-year supply. Others not only stockpile food but emphasize growing and raising their own food. How much “stuff” we buy is limited by our budget. How many skills we learn is limited by the time we have to devote to learning them. Those are the two big factors which can prevent us from attaining our ideal level of preparedness. In my estimation, if you have a preparedness mindset and make whatever preparations you feel are appropriate, you’re a prepper. Ammo can’t be shipped USPS. It sounds like UPS is the best way to go. You can’t take it to a UPS store, but need to take it to a UPS Service Center. You can also create an online account with UPS and have the driver pick up your delivery. January 1, 2014 the ORM-D classification will become obsolete, to bring shipping inline with international standards. Rather than ORM-D, you can use a new funky looking symbol on your boxes. To ship ORM-D, you’re technically supposed to receive hazardous material training, as required by the Department of Transportation. You’re allowed to train and certify yourself. You cannot use paypal to receive payments for ammunition. It violates their policy. It sounds like USPS money order is the best means to accept. I remember when individuals couldn’t purchase ammo through mail order. Some politicians want to revert back to disallowing ammunition sales through mail order. Back then, when hunting season came, you could go to the local hardware store and find sales and load up on 30-30, 12 gauge shells, and 22 LR. You’d pay through the nose for pretty much everything else though. Here’s a neat article about brain fitness.